I’ll be the first to admit that my huntering skills could be a bit rusty due to my lack of gametime lately, but…like, holy s**t…I am actually a bit fatigued right now. My kiting muscles are taxed and I think I wore a hole through my mousing surface. Taming Gumi on the PTR is easily the most difficult taming challenge I’ve ever experienced in the 7 years I’ve been playing a hunter. Those of you that solo-tamed King Krush back in WotLK…that was nothing compared to trying to wrangle this guy. Deth’tilac…pffft! Not even in the same league. Gumi is a total badass. Gumi is one tough mother, as evidenced by the abundant corpses of fallen noobs near his spawn location. He does not patrol, so he’s easy to find. He chills up on the mountain, northwest of One Keg. He is a neutral mob, like the rest of the Spirit Beasts (…apart from Karoma, who has a bad attitude). You must be level 90 to tame him. You do not just simply go up to him and start taming. Like the rest of these new spirit porcupines, Gumi must be brought down to 20% health before he can be tamed — the same strategy that is used to get Deth’tilac. However, unlike the Deth’tilac taming challenge, there are no shortcuts with Gumi. You cannot sacrifice your pet to take off huge chunks of health — you must DPS him down. He has just under 4M health. He is extremely fast and if you let him get within melee range of you, he will smash your face in. He can one-shot you if he gets a crit. I know. I experienced this once. He can be slowed, but he will juke your Frost Trap if you let him, so be advised. I found Concussive Shot and Glaive Toss to be the most reliable slows when kiting him, because he is a huge cheater. He will take shortcuts and exploit the terrain. First of all, Gumi is a Spirit Beast, so you’ll need to be in your BM spec. I didn’t bother redoing any of my talents, as I figured my standard BM PvP spec would do nicely, however, were I to attempt the tame again, I probably would make a couple of tweaks. Here’s how I’d recommend you spec your hunter if you’re going to attempt a Gumi solo-tame. I’ve updated this slightly since my first post. It was pointed out to me that AotIH in Tier 3 would be wasted due to having Cheetah up the whole time. I was a little drained and tired when I posted this. 😉 What I thought was going to be a quick 5-minute tame going into it, turned into a marathon 1hr20min kitefest. Exhilaration is a more useful option, because you might just need a clutch heal. Also, I’ve ignored Tier 2 since Gumi is immune to all roots it seems. Don’t just come at him like you’re Wyatt Earp…do a little prep first. Posthaste is pretty essential for the speed boost. Tier 3 I ignored, but I could see AotIH being useful for buffing damage somewhat. The more DPS you can drop on him – the better. Go with Exhilaration here, as you might need it if he does manage to take a whack at you. 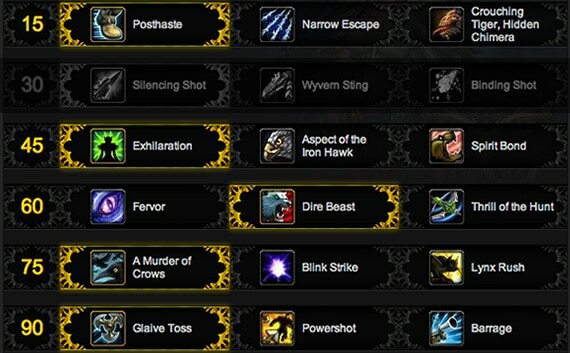 I kept Fervor at Tier 4, but I’d probably suggest Dire Beast for the added DPS. Like a noob, I ignored Tier 5 as well, but you’re probably going to want Murder of Crows for the added damage. You’re definitely going to want Glaive Toss for the additional slow. There are only 2 glyphs that I feel are important here — Pathfinding and Tame Beast. Ice Trap could be useful for the added slowing radius, and Disengage might give you a little additional breathing room, but that’s up to you. You’ll definitely want the added speed boost from Pathfinding, as you’ll be kiting Gumi while in Aspect of the Cheetah. You’ll absolutely need the shorter cast time on Tame Beast. Alright, so you’ve reworked your talents, swapped out a couple glyphs and put on your big boy pants. All that means is that you’re able to attempt the tame. The key in adding this bruiser to your stable is the strategy you employ when taming him. Now it’s time to get to work. Before I began my kitefest, I dismissed my pet. Having a pet out during the kiting process is a huge liability. Regardless of what sort of utility you think it might bring, you don’t want to have to fuss with reviving it and/or dismissing it during the kiting process. Not to mention, you really can’t use it to DPS, because Gumi will just eat it once it’s close enough to him. I started by casting Hunter’s Mark and then placing 3 traps right in front of him — Ice, Explosive & Snake. I then headed towards the path right behind me, waited for my trap cooldowns to expire, then pulled Gumi with a Serpent Sting, followed by Disengage & Concussive Shot. I kited him on the path which leads north towards the Valley of Emperors – turning left at the fork – heading towards Kun Lai Summit. Be sure to turn left here or you’ll have to deal with the hostile mobs on the path to the north. My “rotation” while kiting was basically Concussive Shot, Arcane, Arcane, Arcane – throwing in Serpent Sting as needed, along with Glaive Toss when it was off cooldown. This basic strategy was effective for keeping him at bay, yet not so far away as to cause him to reset or be out of DPS range. 25-30 yards was the sweet spot, I found. I’d drop Explosive Trap and Snake Trap while on the straightaways – placing an occasional Ice Trap when he was breathing down my neck. Disengage (with the Posthaste talent) was also very effective for putting some distance between he and I, when needed. If you’re an Engineer, then your Rocket Boots would provide another cushion cooldown as well, as could any useful racials you might have (Rocket Jump or Darkflight) for creating separation. Once I saw Kill Shot become active (signaling he was below 20% and able to be tamed), I dropped an Ice Trap, Conc Shotted him and started casting Tame Beast. The timer expired just as he was about to rip my face off. He hit me once, but I survived it. A little too close for comfort, but I got him! I attempted this tame about 10 times before I nailed it. It is not a cakewalk. A few of my fails were due to careless mistakes, like: not being properly glyphed, getting too far from him – causing him to reset, and forgetting to start out in Aspect of the Cheetah, however, I’d say at least a half-dozen of my fails were just due to minor mistakes. If you blow it at all during the tame, he will exploit your error and wreck you. When you go to tame him, be sure you’re a safe distance away, and in a straightaway area where you know he’s going to hit your Ice Trap. Drop the trap first, Conc Shot him, then cast Tame Beast. I died 3 times while taming him, because he either skirted my trap or I didn’t create enough space between he and I before casting the tame. Good luck to those of you hoping to add this guy to your stable in Patch 5.2! Stop by my page – ????? ???? ??????? Look at my homepage: ????? ???????? ???????? Have a look at my homepage … ?????? ????? ?? ?? Great info for this tame! I just laid down an ice trap, binding shot, popped rapid fire with stampede and MoC. Only had to use disengage once and bam, tamed Gumi. I got first time. Thx for the info. Also, Binding Shot works extremely well. Just successfully tamed him, thanks to this guide. Thanks Garwulf! Yagenaud, there’s no shame in failing on this tame. It is quite difficult in that you have to be near-perfect with your every move. The slightest mistakes and you’re hosed. With as much experience as I have now with this tame, I’d be hard-pressed to one-shot it on live. But…I’ve got to try at least. Good luck to all those of you going after Gumi! Congratulations Gar! It was exciting just reading about it. I can only imagine what the actual tame was like. I hope it carrys over on live for you. 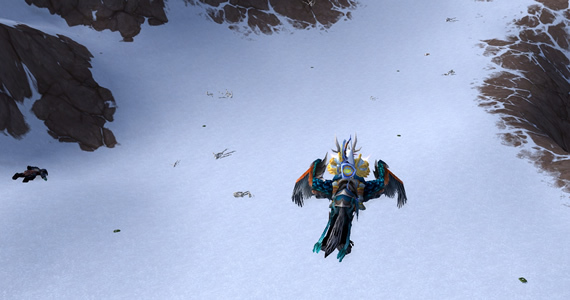 I think I’ll be wait the the “new” to die off before attempting to tame any if these if cross-realmed Northrend is any indication of how vicious the competition will be. It’s damned ugly out there right now, especially over Arcturis. I started playing right after Cata launched and missed all the fun for these and only caught the tail end of it with the 5.1 spirit beasts. Kind of glad I did. Hey Garwulf, thanks for the information- it is most useful, as always. But I was wondering, does this guy have a spawn time similar to the other beasts or does he spawn more often due to the challenge? 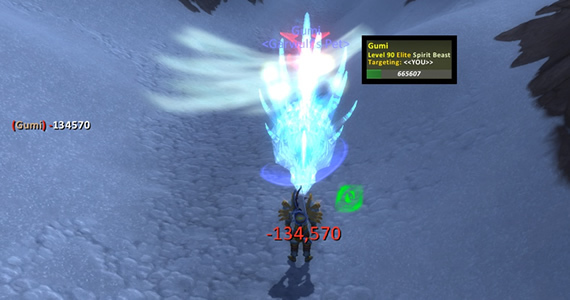 His respawn rate is really fast on the PTR – same as any other mob. They probably did this to give plenty of players an opportunity to try taming these new SBs. Once live, I’m betting they’ll be on 4-6 hr timers. Just tamed Savage after a total of 5 hours over 2 days derping around. I feel like breaking out the champagne, but all I have is orange juice. Sorry I whined so much! Just thought I should point out a small flaw in your suggested spec mate. Since you’re in AotC, there is no point speccing AotIH. Admittedly, it might not make much difference, but surely exhilaration would make more sense, especially if you can combine it with a pot/healthstone or the item ive had off my farm which applies a hot, but the name of which I cannot remember for the life of me! Also, for a bit more breathing space, wouldn’t it be worthwhile for engineers to have nitro boots on standby? Both good points. I spaced it on the AotIH suggestion. The Nitro Boots would be a good idea for engineers, just to provide a little added insurance. Excellent suggestion! Would a glyphed explosive trap knockback be decent? Are there any places to use terrain to knock him off with a longer return path? Or hopping down something and then coming up another way while he takes another route? I’m thinking BWL kiting days. Seems like the Monastery might have some. If that kind of stuff is useful, maybe Powershot’s knockback could also have use. Though my fingers are pre-wired for Glaive Toss. Would a ranged attack pet be useful at all? I never use them and don’t know if they’d try to stay at range. Probably just get one-shot, right? I think that maintaining a consistent range between you and he is best. The Explosive Trap knockback would probably only make things clumsier. I really wouldn’t bother with a pet. If it dies at any point, you’ll be lowering your success rate by having to deal with res’ing and then dismissing it before taming Gumi. It may sound like a good strategy – and may work for some – but once you see how manic the kiting process is, you may not want to add in that little complication. Just chipping away at him with no pet would be my recommendation. The road seems like the logical place to kite him since it offers a few long straightaways where you can drop some traps in his path. As I’d mentioned, others may find an easier or more efficient way of doing this, but the path to Shado-Pan is where I’d suggest leading him. 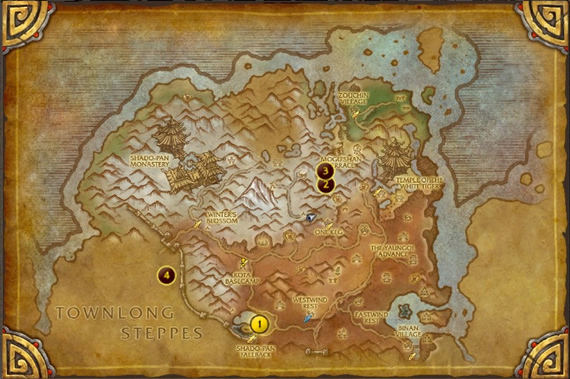 Also, be sure to hop on your mount and research your route first.